THE first of three new defence systems has been installed on the HMS Queen Elizabeth. The Royal Navy’s £3bn aircraft carrier is under going work to ensure she has the equipment and improvements she needs after returning to Portsmouth from the United States of America. Part of this includes the installation of a Phalanx 1B, which was fitted and mounted yesterday. The HMS Queen Elizabeth’s official twitter account was on hand to explain the purpose of the ship’s new weapon. They tweeted: ‘It is....... a Phalanx 1B. ‘A rapid-fire radar and electro-optical guided gun, the first of three to be fitted. The weapon is designed and manufactured by the General Dynamics Corporation, Pomona Division. Two more are set to be fitted on the HMS Queen Elizabeth. Because of the Phalanx’s distinctive barrel-shaped radome and their automated nature, they are sometimes known by the nickname R2-D2 - based on the Star Wars character of the same name. 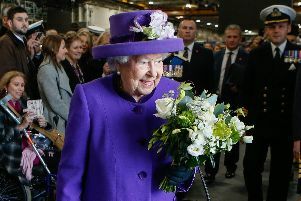 The Phalanax arrived in Portsmouth on Tuesday and the HMS Queen Elizabeth encouraged people to guess what it was, as the package was covered. Which sparked a number of hilarious responses on twitter. One person suggested that it could be ‘vacuum packed Royal Marine Commandos’. There was speculation that it could be the ‘CO’s hot tub’ or ‘February's supply of teabags’. The HMS Queen Elizabeth is set to be reunited with her sister ship HMS Prince of Wales later this year. She is due to set sail for Scotland in the summer for her first set of major stint of maintenance work. HMS Queen Elizabeth will leave her Portsmouth home and sail to the enormous dry dock facility in Rosyth.